We stand amazed in the presence of our Heavenly Father. Truly, His hand upon the ministry He has given us is so evident and we are humbled and most grateful for the dedicated teammates like you who have been so faithful with prayers and support. The outreach to reservation Indians continues to grow! As we move into the month of May, we have completed 51 mission trips, visiting 67 different places. The eighteen-wheeler was used on 12 of these trips. God has never failed us and He is providing food, clothing, household items, and operating money day by day through His servants like you. Our hearts cry out, "Lead on, oh, King eternal! Thine is the glory." We thank Leston and Shirley Phipps for making another Big Rig trip to the Pine Ridge Reservation in South Dakota. We will feature it in the next newsletter. Does it seem that your path is more thorny as you journey along on lifes way? Two men, both seriously ill, occupied the same hospital room. One man was allowed to sit up in his bed for an hour each afternoon to help drain the fluid from his lungs. His bed was next to the rooms only window. The other man had to spend all his time flat on his back. The men talked for hours on end. They spoke of their wives and families, their homes, their jobs, their involvement in the military, and where they had been on vacation. Every afternoon when the man in the bed by the window could sit up, he would pass the time by describing to his roommate all the things he could see outside the window. The man in the other bed began to live for those one-hour periods where his world would be broadened and enlivened by all the activity and color of the world outside. The window overlooked a park with a lovely lake. Ducks and swans played on the water while children sailed their model boats. Young lovers walked arm in arm amidst flowers of every color in the rainbow. Grand old trees graced the landscape, and a fine view of the city skyline could be seen in the distance. As the man by the window described all this in exquisite detail, the man on the other side of the room would close his eyes and imagine the picturesque scene. One warm afternoon, the man by the window described a parade passing by. Although the other man couldnt hear the band  he could see it in his minds eye as the gentleman by the window portrayed it with descriptive words. Days and weeks passed. It faced a blank wall. The man asked the nurse what could have compelled his deceased roommate to describe such wonderful things outside this window. The nurse reported that the man was blind and could not even see the wall. She said, "Perhaps he just wanted to encourage you." I picked this up at a Montana truck stop. It convicted me! We have our eyes, we have our health. We have our Lord and Savior, Jesus Christ. I pray God to make us "encouragers"! 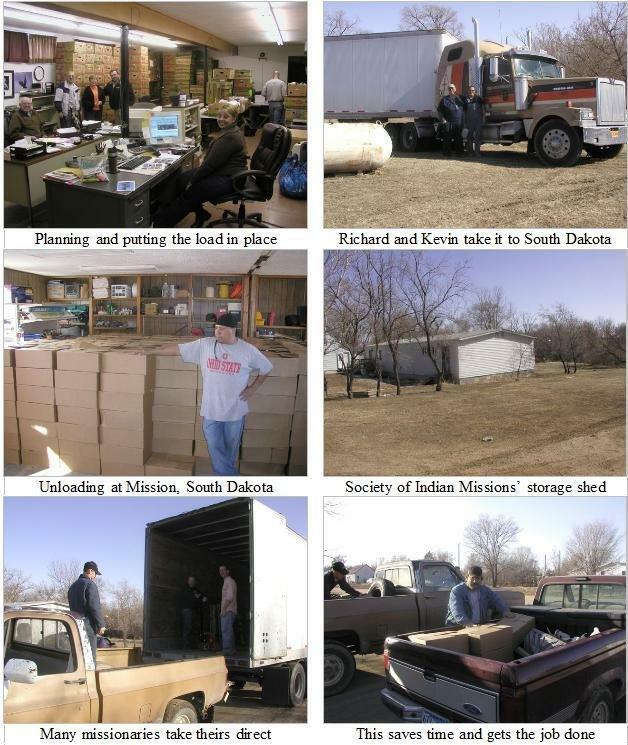 The society of Indian missions has been used of God for many years on Indian reservations of the Rocky Mountains and the Dakotas. What a glorious privilege has been ours to be their helpers. We had the Big Rig loaded and needed a driver. Bro. Dave Gowan guided the people of the Newport, OR Nazarene Church to our office with their gift of 67 boxes of excellent clothes. One of them, Richard Wanke, excitedly told of his desire to make a trip for us. This busy businessman and his son, Kevin, have several Big Rigs of their own. Their good driving records and their zeal caused me to see that "for such a time as this" God had sent them. They agreed and they made a hurried trip between storms to Mission, South Dakota on the Rosebud Reservation. How we thank them and praise God! For many years the good people of the Church of God (Anderson, Ind.) have reached out to the Indian people of the Tulalip Reservation located north of Seattle. For most of that time they have been the only food bank which has been a great blessing to people in need. First Nation Ministries is honored to get in on the action and get in on the blessing. Frances Morden is in charge of the food bank operation and it is a joy for us to have been associated with her for many years. On Saturday, March 28th, Jeff Phipps, Bob King, and Don Cline took the fully loaded Dodge and big van trailer to this work. After a good nights rest, we worshipped and shared with the band of believers in the Sunday morning service. Rev. Emitt Thrower, the pastor, is a precious brother and fellow servant in the Lord and it is always a delight to worship with them. After meeting with the "Prayer Band" on April 3rd, Don Cline, Jeff Phipps, and Bob King had a beautiful trip up the Columbia River gorge. This mighty river puts more water into the Pacific Ocean than all the other west coast rivers combined. Our destination was the Celilo Indian Village. It is always a delight to get together with Fred and Karen Whitford who are our point people. They shared their concern for a village similar to theirs called Georgeville. It is just a few miles northeast of Goldendale, WA. Celilo has been sharing their blessings from First Nation Ministries with these people. This blesses us, as one needy group of Indians who love Jesus care about others less fortunate than they are. Saturday, May 25th, as the sun peaked over the eastern horizon, Ted Boyd and Don Cline were well on the way up the beautiful Columbia River Gorge. The big Dodge Diesel and Wells Cargo trailer ate up the miles and we arrived at Alberton, Montana to unload at Northwest Indian Bible School shortly after noon. They were having spring break, but had left a group of strong young men to unload us. They did this in an hours time, so we decided to get on home. There was very little traffic; evidently the recession and the price of fuel had discouraged much travel. We were both feeling younger than our years and arrived home shortly after midnight. We praise God for His blessing and protection and the wonderful fellowship of two old boys who have been on so many mission trips together over the past thirty years.